Expedition 58 capped off its busy weekend with additional outfitting for the SpaceX Crew Dragon, which had only completed its hard dock to the International Space Station yesterday morning as part of the Demo-1 uncrewed flight test. After opening the hatch between the two spacecraft, the crewmates configured Crew Dragon for its stay at the orbiting laboratory. This work included installation of the intramodule ventilation system, which helps cycle air from Crew Dragon to station. The crew members ticked off additional items from their checklist, also installing window covers and checking valves before taking part in a welcoming ceremony for the visiting vehicle at 10:45 a.m. EST Sunday, which aired on NASA Television. 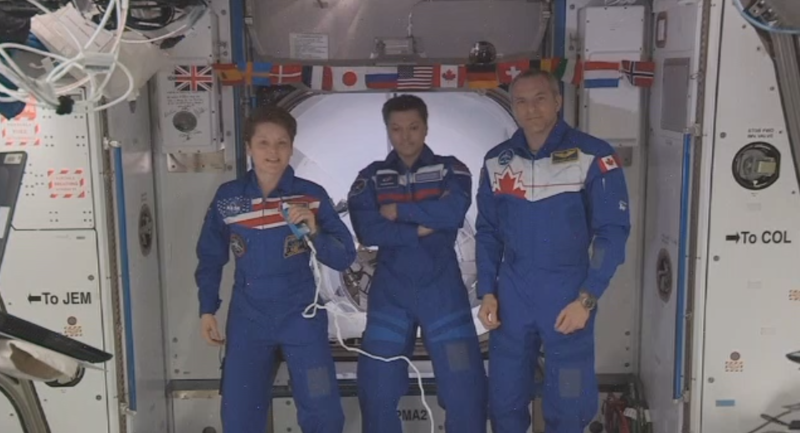 Today, NASA astronaut Anne McClain, David Saint-Jacques of the Canadian Space Agency and Russian cosmonaut and Expedition 58 Commander Oleg Kononenko went over emergency procedures specific to Crew Dragon’s stay in orbit. While Crew Dragon is designed to remain docked to the space station for up to 210 days, this test of the spacecraft will be much shorter, ending early Friday morning. Crew Dragon is expected to return to Earth with a splashdown in the Atlantic Ocean at approximately 8:45 a.m. on Friday, March 8—a little more than six hours after its separation from station. While Kononenko was focused on the Plasma Kristall-4 experiment, which investigates the liquid phase and flow phenomena of complex plasmas, for this week’s runs, McClain and Saint-Jacques spent most of the day in the Quest airlock. The pair worked on their EMU [Extravehicular Mobility Unit] spacesuits, making sure their suits fit in advance of a series of spacewalks currently slated for late March and early April. Saint-Jacques also made time in the day to connect with junior high school and college students in Hallifax, Nova Scotia, through a space-to-ground downlink where he shared his perspective of living and working aboard the world’s only microgravity laboratory. Learn more about station activities by following @space_station and @ISS_Research on Twitter, as well as the ISS Facebook and ISS Instagram accounts. I love what you are doing for the future of space exploration. I think this will really help people realize what we can achieve and that there is always a opportunity to learn something new. I have a fun to read it everyday!!! It is improved my English skill and my space knowledge. I study English and other subjects for working in NASA in future. See you again when I become adult. I will keep reading it !!!!! !